Google's 'possible' new Nexus Phone has been unboxed on camera and video, showing off a decent high-end handset. While the specs and shape of the phone have been comprehensively leaked on to the web thanks to the likes of Twitter and over-eager Google employees, this is probably the most complete run down so far. Twitter user Phillm has posted all the information online, and the video clearly shows the new phone packing a heavily modified Android interface with some cool menu options, such as 3D animations. It looks like it works very fast to the touch, and the amount of multi-tasking initially shown in the video bodes well for a phone that's apparently packing an industry-leading processor. We'd still be surprised if the Nexus One name stuck, but the Google-branded box seems to hint that it will be there at launch in (likely) early January, although packaging can change in a heartbeat. 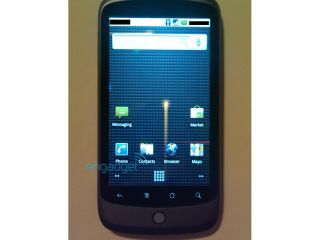 The Nexus One certainly takes a lot of cues from the HTC range, which is no bad thing given the success the company has had this year - the only question is whether the company will unveil the mooted (and similarly specced Bravo) alongside it.